Pauliina has been working diligently for the last five years to demonstrate that a plant-based diet is a way toward a vibrant and healthy life. She and her husband Arttu arrived in Bali a few years ago and took over a small raw food stand at the Green School. Since then, they turned that small business into the thriving, popular Living Food Lab brand. We sat down with Pauliina at the Canggu location with a decadent raw food meal, a turmeric latte and some words of inspiration. YT: Pauliina, you mentioned to us that neither you nor your husband Arttu have a restaurateur background. What made you start ‘Living Food Lab’? Pauliina Salmenhaara: True, we had no idea what being a restaurateur involved, apart from the cocktail of craziness, passion, and dedication. The funny thing is, when we started dating in 1998, we connected over a love of wine, coffee and food, and dream-talked about how nice it would be to have our own restaurant and walk around engaging with guests, talking the night away. Ah…what romantics we were! We knew back then that being a restaurateur is a 24/7 job, and we didn’t want to be deep in the business. We also had careers - Arttu at Kone and me with human rights. Well, turns out that we talked our way into our romantic dream! We bought Living Food Lab in mid-2017 and were based at Green School, the perfect springboard for our larger vision to establish plant-based food schools around the world. YT: What inspired the up and coming coworking raw, plant-based modern space in Canggu? Pauliina Salmenhaara: In addition to a shared love of food, Arttu and I have a surprisingly mutual flair for industrial design. We wanted to create an industrial-meets-green coworking space where our community can coalesce. After finding visual inspiration on Pinterest, sketching designs, and envisioning our services, we met with an architect to refine our ideas to fruition. The result you see today is an array of green, wood, and metal decor combined to form a simple yet sophisticated Living Food Lab. YT: What was your first experience with vegan, raw cuisine? Pauliina Salmenhaara: Simple - eating fruit. But talking about raw cuisine - sometime in Bali during 2010. I stumbled across the idea of raw food when I simultaneously began studying alternative therapies and was already making personal changes to my diet like cutting out additives, preservatives, dairy, sugar, MSG, and gluten. 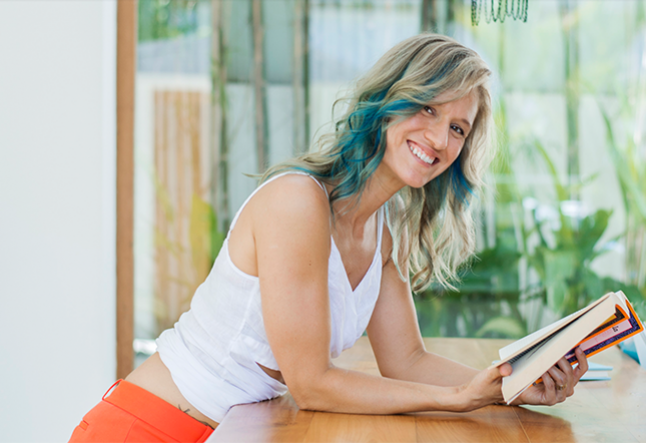 We were spending a lot of time in Bali immersing ourselves in a vegan lifestyle, but it was a dear friend who recommended I take Elaina Love’s raw food chef certification. I dove head first and completed her one-month course in Bali in 2013. Elaina Love was my raw food foundation for my personal business, R.A.W Inside Out in Singapore. 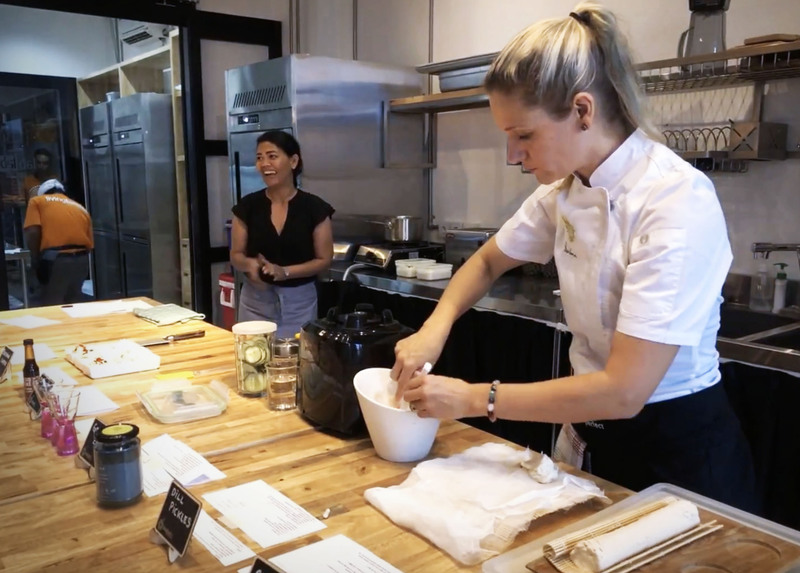 I continued to soak in more knowledge from various raw food influencers and eventually ended up doing a 7-month study at Matthew Kenney Culinary Academy, in Thailand, Maine, and New York. YT: What about a raw lifestyle do you think is most important? Ethics: I follow a code of love and compassion to the best of my ability. It is no longer within me to be able to eat anything that is an animal or comes from an animal. Morality: To me, it’s plain wrong to eat another living being, be it animal or human. Body-Responsibility: I thrive on vegetables, fruit, nuts, seeds and legumes, when they are either raw, lightly steamed, quickly sautéed, or oven-baked. Animal-based or animal-derived products deplete my energy and are hard to digest. Earth-Responsibility: I want to support Mother Earth, not exhaust her resources. A plant-based lifestyle seems a kinder path than a meat-based one. Human-Responsibility: What legacy am I leaving behind? I want to leave a path of greater happiness and healthiness for generations following mine. YT: Who has influenced you on this path? Pauliina Salmenhaara: I have been influenced by dear friends, teachers, and my vegan community such as Vivian Sutanto, Elaina Love, Matthew Kenney, Kaitlyn Misheff, Luke Tan, Emilie Tan, Richie Roll, Joe the Juicer, Frank Ferrante. I’ve also been moved by documentaries on vegan food and sustainability, by activists and influencers. My children continuously inspire me. I want to set an example for them. Though they aren’t vegan and I will never ask them to be, I hope to be a positive influence if they decide to become vegan. Finally, those with health issues, disorders, and disease constantly remind me of my purpose - to take care of my body, humanity, and mother nature through the power of raw food. YT: You describe Living Food Lab as more than a restaurant. In what way? Pauliina Salmenhaara: Although the Living Food Lab is about food, it’s never just about food. I don’t see food merely as food. I see it as a part of something more significant, both in the sense of where it came from, who grew, transported, prepared, and served it. I also look at food in the context of who is eating it, how it’s eaten, and in what kind of environment it’s consumed in. I strive to make the Living Food Lab a conscious eatery in all aspects of food. Living Food Lab is a multi-concept space, and it will always continue to evolve beyond food. YT: The restaurant design is minimalistic and modern. What inspired this? Pauliina Salmenhaara: The design was influenced by architectural concepts Arttu and I both enjoy - minimalistic, industrial, and detailed. Not everything has to be obvious, some of the structures are subtle like our Chinese inspired breakfast bar. We blended in aspects of Traditional Chinese medicine shops from Shanghai into the space, since food is medicine, after all. YT: What experience do you want customers to have at Living Food Lab? Pauliina Salmenhaara: We would like for our guests to feel welcomed into our space as our family. We get giddy when we see people working upstairs, enjoying the artwork, sipping on healing drinks, and enjoying nourishing foods. Living Food Lab is all about a conscious eating experience dedicated to our customer’s health and wellness. We want them to walk away feeling productive and impactful. YT: We noticed a huge kitchen above the restaurant. What is it for? Pauliina Salmenhaara: The large kitchen is our Education Lab, where the raw food magic happens. To teach interested individuals and grow the raw food community, we host vegan workshops and classes. Our team also utilizes the kitchen for recipe testing and training. Each table works as a stand-alone or can connect to each other for one large area, the way it is typically. YT: In your opinion, is eating raw and vegan an art or science? Pauliina Salmenhaara: Before I answer, let me clarify I am not entirely raw, nor do I encourage others to do so. My main focus is on vegan cooking. So is veganism an art or science? I say both! Some elements are scientific, such as getting the right ratio of probiotic to water to nuts in making vegan cheese. However, at some point, our foundation becomes stable enough for us to break into creative flows and that's when vegan cooking becomes an art. All cooking is really an art form used to express our novel ideas based on our knowledge of how ingredients fuse and blend together into a delicious experience. YT: What roles do you and Arttu play in the business? Pauliina Salmenhaara: Arttu is focused on the financial and legal side of the Living Food Lab - lots of behind-the-scenes work. He is also my go-to person for bouncing new ideas around, getting sincere feedback, and encouraging me in doubtful moments. Ultimately, he is my mentor and business advisor. My role as a director means I am much more involved with the team and our guests, as well as day-to-day operations, finances, marketing, social media and more. YT: Your team seems very happy here, what working environment do you hope to make for your restaurant? Pauliina Salmenhaara: I am the proudest of our Living Food Lab team. They are my family, and I care for each one genuinely. Our team leaders – head barista, floor supervisors, restaurant manager Canggu and operations manager at Green School all have a sense of responsibility towards their teams. Our working environment is based on open communication. Everyone is encouraged to speak their minds. If there are any personal issues, any work-related grievances, any personal dreams or plans, we want to hear about them and support our team. The one thing we hear a lot from our team is that they feel apart of a family. To me, our family vibe is essential and I work hard to keep it up. YT: What values do you look for in the team that works with you? Pauliina Salmenhaara: Kindness, honesty, the courage to speak up, helpfulness, respect, love, compassion, honor. And a fantastic sense of humor! YT: What is your vision for the future of Living Food Lab? Pauliina Salmenhaara: Our vision for Living Food Lab is to bring our food, concepts, and services to more schools in Bali, Indonesia, Asia, Europe, America – I will seriously consider any location we are asked to go. For now, our real focus is to grow in Bali. The next step will be to open small-scale model in Helsinki, Finland. We have some exciting collaborations brewing under the surface, but we can’t share them yet. We don’t want to jinx anything!